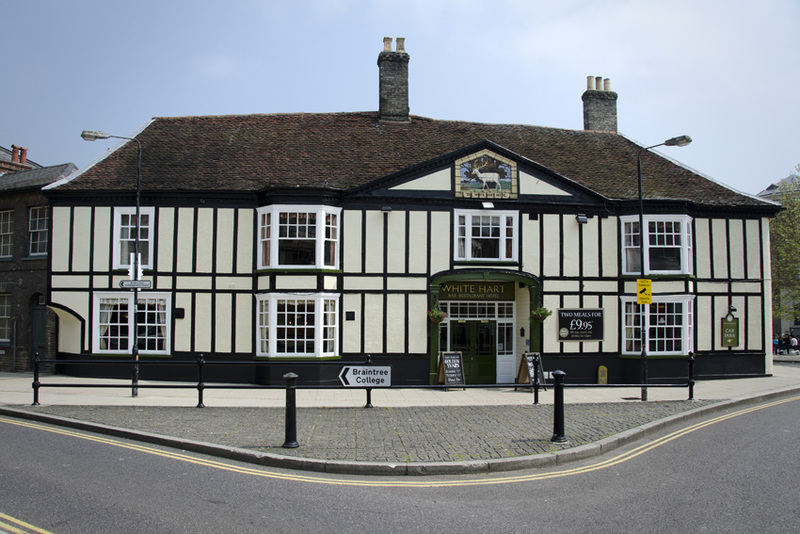 The White Hart Hotel Braintree is located in the centre of the Essex market town of Braintree, near to Witham, Chelmsford and Colchester via the A120, Also with easy access to Stansted Airport. The earliest mention of the historic White Hart Hotel Braintree in official records is as late as 1591, when a court was held there. However the plentiful timbers evident in the White Hart hotel’s main block have been positively dated to the early Tudor period, and tradition has it that the cellars are older still. In the later years the hotel was a staging point for some of the most prestigious coach services in the region such as the Old Bury between London and Bury St Edmunds, the Phenomenon, which ran between London and Norwich, and the Hope, which connected Chelmsford and Colchester. Today the White Hart Hotel is a popular meeting place for locals and a good base for exploring the area. The hotel has the facility to hold weddings, conferences and events for up to 60 people sit down meal and an evening reception up to 150. The hotel has a wedding licence.